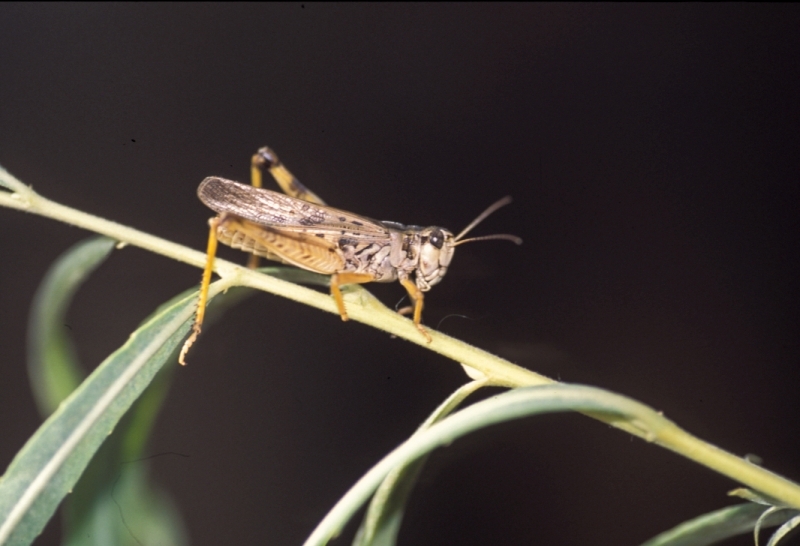 Grasshoppers have eaten most of the leaves off our apple trees and vegetables in our garden in St Anthony. When I walk or ride my Ranger out in the pasture clouds of hoppers fly everywhere. I can’t remember a year with more hoppers. Last week I stopped by one of my favorite haunts on Fall River on my way home from work. I only had a couple of hours. I rigged up a Morrish Hopper with a Pheasant Tail Bead dropper. There were eager trout in every pool. Most of the fish that ate the nymph were smaller rainbows but the larger rainbows and browns went for the hopper. I also caught a couple of cutthroats in the 16 inch range. I had to pass on some of the best water as I had to make a 6pm meeting. 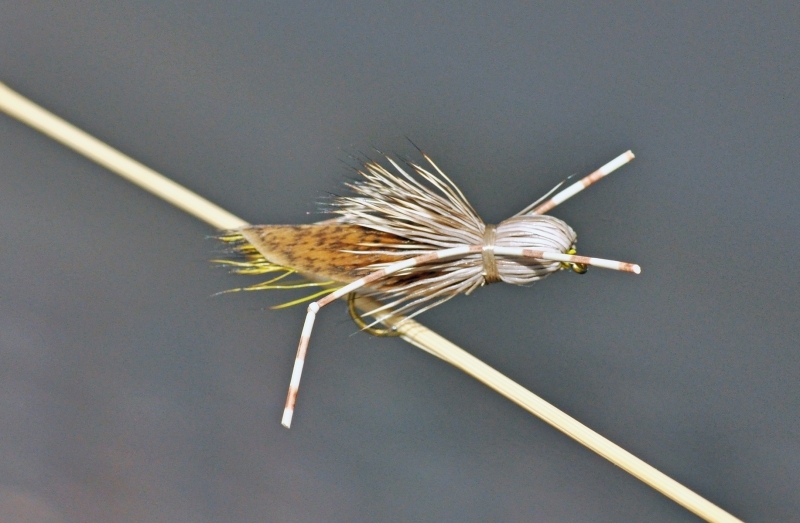 Years ago, before I got into the fly fishing business, Dave Whitlock wrote a magazine article entitled “Hoppertunity.” In the article he introduced us to Dave’s Hopper which at that time was definitely a big step up from the impressionistic hopper patterns of the day. Dave’s Hopper actually looked like a real hopper. It was a game changer and still a very effective hopper pattern to this day. I got into the hopper thing on the Ranch back in the early 1970’s. Initially Dave’s Hopper did what was expected but the trout got wise fast. When a big trout picked off all of the naturals after the wind blew a raft of them onto the water leaving your fly untouched, you knew you needed a better pattern. I went to work by catching naturals, taking them home, and placing them on the surface in a deep glass pan with a mirror at the bottom. After looking at the trout’s view, along with viewing the real hoppers from the side as they sat in the surface film, I quickly realized the problem and the challenge. A fly that matched the coloration of the naturals yet sat low in the water surface was needed. Bennett’s Hopper, described by Vince Marinaro in A Modern Dry Fly Code, offered the perfect solution. I worked up a couple and they were deadly on the Ranch. The problem was they were very difficult and time consuming to tie and even more difficult to find the right hooks and materials. I experimented for a better solution. I found that if I used long natural elk rump hair I could accentuate the body and the color was perfect. I kept the new pattern under wraps until 1977 when we introduced the new hopper in our shop as the Henry’s Fork Hopper. It is still a killer pattern on Ranch today. The advent of foam really changed the hopper game. Today there are literally dozens of great patterns that work on the soft flowing currents of the Ranch as well as fast water like the Madison. The Morrish Hopper, Rainy’s Hopper, More or Less Hopper, and Thunder Thighs Hopper are among my favorites. Along with the Henry’s Fork Hopper some of the old patterns like the reliable Dave’s Hopper and Parachute Hopper should also be a part of your terrestrial fly box. In today’s world a lunker trout might have seen all of these patterns and more before you cross paths with him. Accurate casting and a drag free drift are essential. Natural hoppers can create a bit of a commotion with their kicking action after they land on the water. Twitching the fly can help mimic this action but if you twitch too much so the fly doesn’t drift drag free you’ll be out of the game. 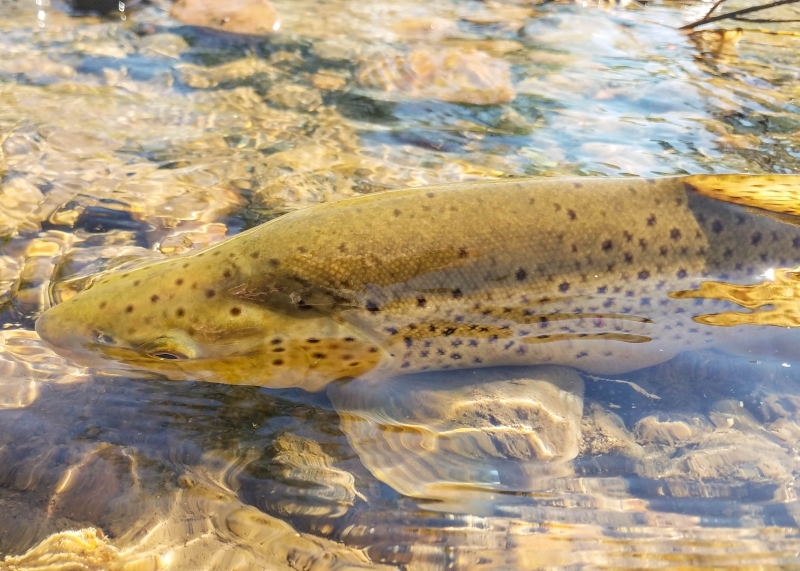 Large wary trout often hold very tight to the bank or other structure. You’ll also be out of the game if you miss by an inch or two. 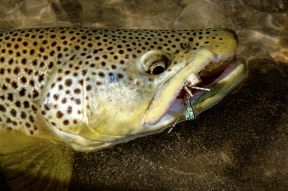 Some anglers believe that the only place to catch trout with hoppers is close to the bank. There is a flip side to that. Most of our natural hoppers can fly pretty good, at least enough to make it more than half way across the river in the Ranch before they splat into the river. I often fish the middle of the river, especially if the banks are getting pounded. We live in grasshopper mecca here on the Henry’s Fork. 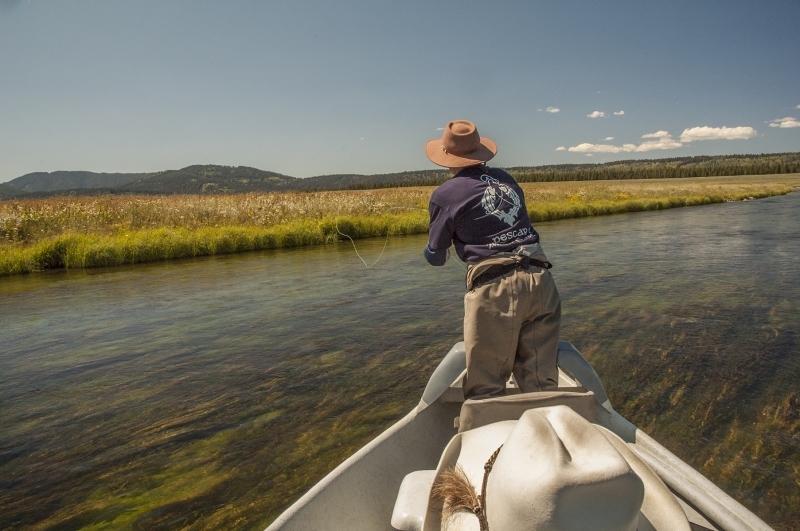 While the Ranch and the Harriman East water below Osborne Bridge gets most of the attention, the lower stretches of the river from Mesa Falls downstream can also produce exceptional hopper fishing. The tributary streams like Fall River, Warm River and the Teton River also provide great opportunities for quality hopper fishing. 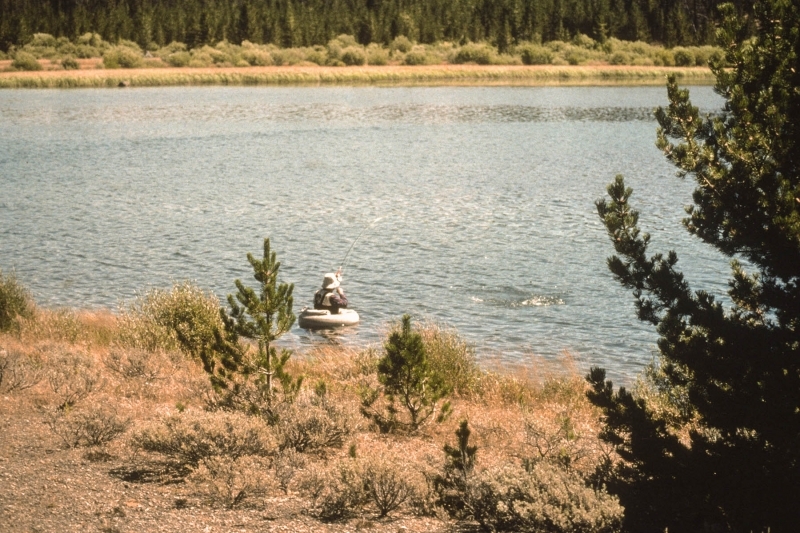 Hoppers also work very well on the Madison River and the South Fork of the Snake. On these heavily fished rivers I often drop a small ant or beetle about 8 inches below the hopper. The hopper pattern will get the trout’s attention but the small dry dropper will get him to commit. 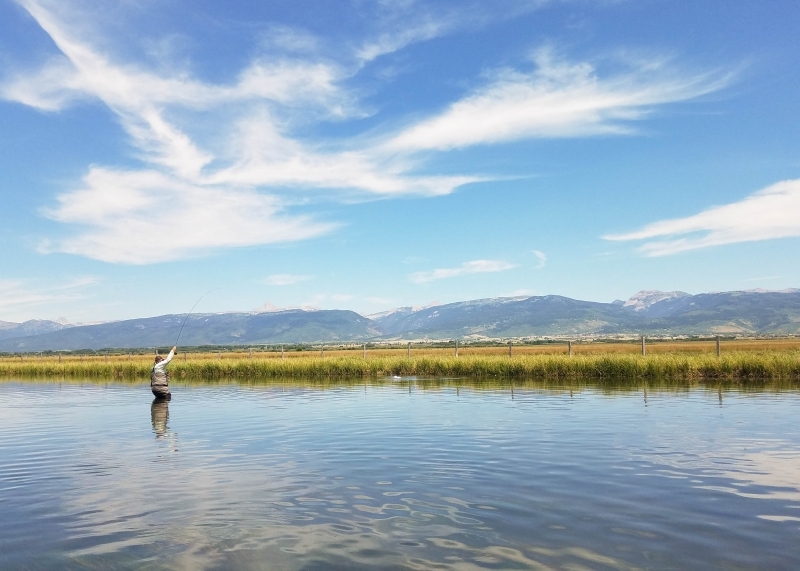 Some the best hopper fishing in our region can be found in Yellowstone National Park. My favorite streams include Slough Creek, the Lamar River, upper Gibbon Meadows, Gallatin, and Gardiner Rivers. The Madison downstream from the 9 mile bridge can also be good. I stay away from the Firehole until the water cools in September. Don’t neglect the lakes. I’ve had great hopper fishing on Hebgen and Quake Lakes in Montana especially after the wind came up in the afternoon. There are also some smaller lakes located northeast of Ashton on the Sand Creek Wildlife Management Area. A few years ago my brother Rick and I went there in the morning to fish gulpers rising to Callibaetis spinners. After the wind came up we sat on the dike and ate our lunch. Occasionally we heard trout rising but we didn’t connect the dots until a hopper blew in not far from us and it got munched. We spread out, cast our hoppers blindly out on the water, and sat on the dike. We really caught some good trout. It was some of the laziest fishing I’ve ever done. I wish I’d have brought an umbrella. The hopper/dropper set up with a nymph tied two or three feet from the bend of the hopper hook has been a very effective method for decades. I frequently use this set up but I clip the dropper off and keep it in my fly patch whenever I need to get the hopper right on the bank or other structure. I like banks with a dark shadow below the grass that indicates an undercut. Other good holding spots are in front of rocks, bushes, streamside logs and drop offs. My favorite time is August and September and August is quickly slipping away. I love this time of year when the trout are actively feeding on mayflies and caddis but big trout are always keen to eat hoppers and other terrestrials. The best is yet to come.